Every year I try to make a couple new Christmas ornaments for the tree. So far I've made hand and feet salt dough ornaments and felt and milk jug ornaments. 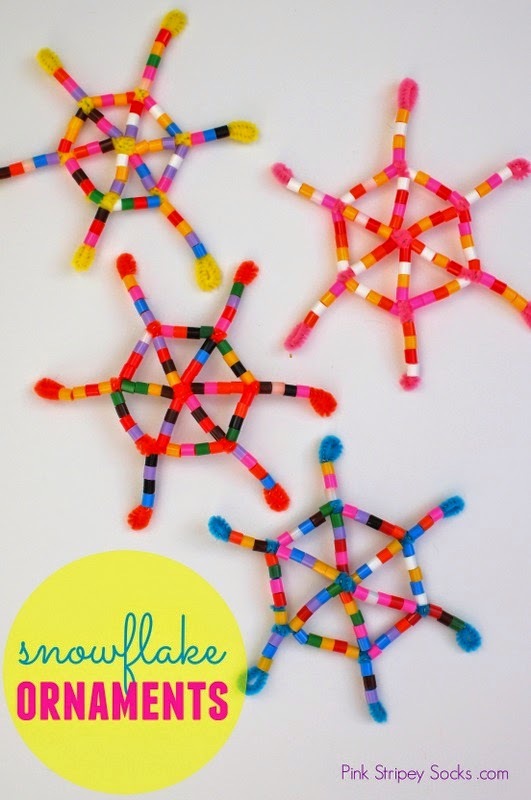 This year I used Perler Beads and pipe cleaners to create easy snowflake ornaments! These were so incredibly easy to make and the colors make me happy. Keep reading to see how you can make some of your own! 1. Cut 2 pipe cleaners in half. 2. 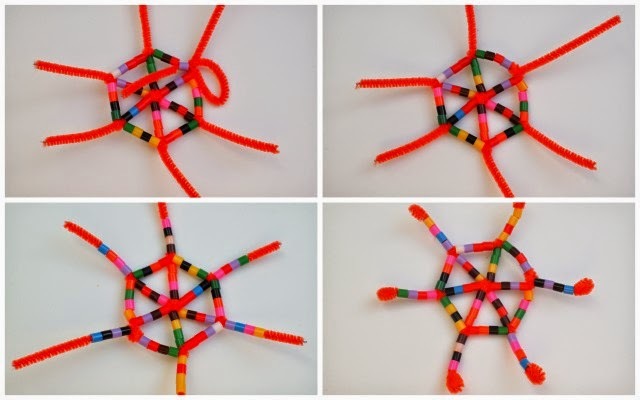 Twist 3 half pieces of pipe cleaner together to create a star pattern resembling the spokes of a wheel. 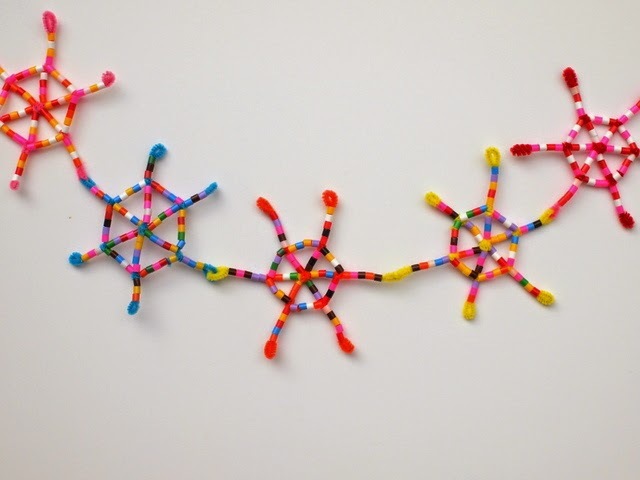 Then, string on 3 or 4 Perler beads onto each piece of pipe cleaner. 3. 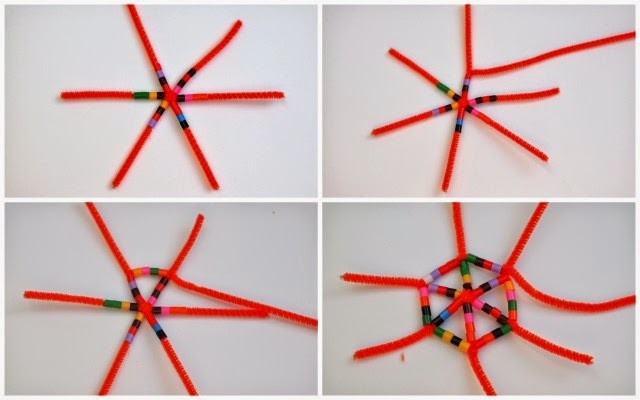 Take your whole pipe cleaner and stick one end through one column of 3 beads (one "spoke of the wheel.") This should secure the pipe cleaner in place. 4. 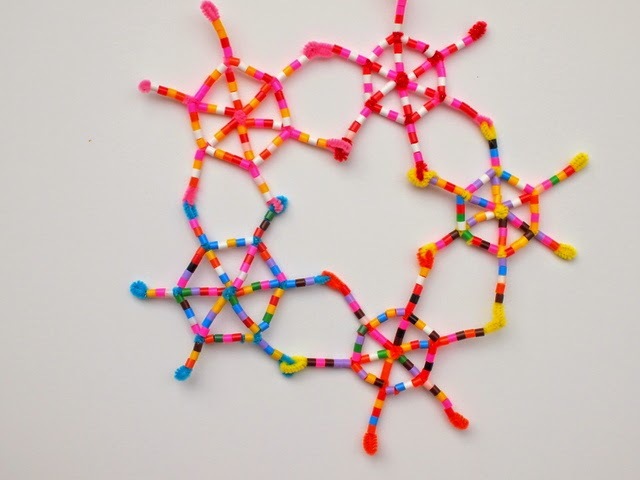 Now string 4 or 5 Perler beads onto your pipe cleaner. Now twist it around the following pipe cleaner "spoke." 5. 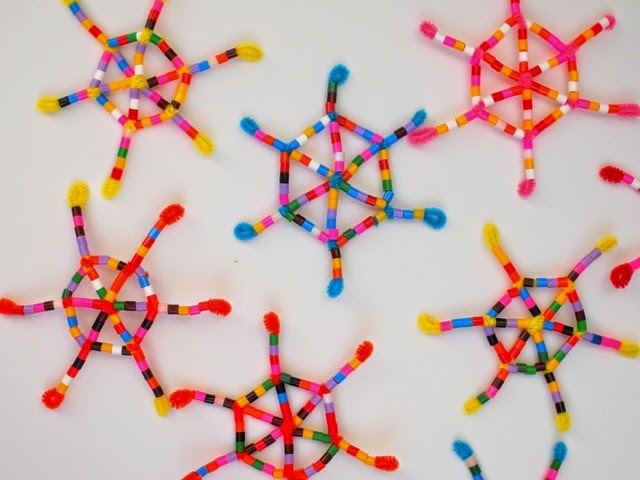 Continue stringing 4 or 5 Perler beads and then twisting your pipe cleaner around each spoke of the wheel. 6. Now it's time to secure this end of the pipe cleaner. After wrapping the pipe cleaner around the last "spoke" push it through the last Perler bead you attached. Pull very hard. Your pipe cleaner should go through. 7. Trim off the excess bit. 8. Add 4 or 5 additional Perler Beads to the "spokes"
9. To keep Perler beads from falling off, roll your pipe cleaner ends up. Tada! Now you have some lovely snowflakes! They would make colorful ornaments for the tree. Or a unique and colorful Christmas wreath! I really liked how this wreath looked, so it's now hanging on our door! Like this idea? You can always find other fun ideas on my Pinterest, Facebook, Instagram, or Twitter accounts! Or, just sign up for the weekly newsletter in the pink bar at the top of the site.